This new book, Bring Out Their Best provides a practical framework for introducing coaching into Australian organisations and offers, for the first time, best practice Australian case studies on the implementation of coaching culture. �Old style management techniques don�t work any more. Coaching has been proven to be the best way to bring out the innovation, creativity and accountability in your staff. A coaching culture encourages people at all levels to engage in open and honest conversations that are focused on bringing out the best in themselves and their teams,� says Natalie. The book features more than thirty case studies from Australia�s best corporate coaches and companies including Sunsuper, Super Cheap Auto Group, Centrelink and The Reach Foundation. It is the most up-to-date and relevant workplace study of Australian coaching. It is a must read book for human resources professionals, senior managers, team leaders and business owners wishing to implement a coaching culture more relevant to the Australian workplace and to keep abreast of trends in the marketplace. Bring Out Their Best shows how to build a corporate culture where people use coaching skills to engage with each other, build relationships and achieve a high level of performance through the alignment of values, vision and commitment. 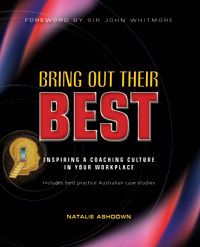 Natalie Ashdown is a champion of implementing coaching culture within organisations and her vision for Australian organisations is that coaching "becomes the way we do things around here". Natalie is the Director of the Open Door Coaching Group. She is an experienced and creative writer and has developed and written the workbooks and leadership programs used by Open Door and their clients.